Many melodramas are as small in scale as the hearts of one or two individuals. Ode to my Father, however is decidedly more epic in scope - this is a movie about the soul of Korea, of Koreans, of an entire nation across multiple generations. It is no wonder that, at this time of writing, Yoon Je-kyoon's feature is the second-highest attended film in all of South Korean cinema history. Yoon's movie tells the story of Deok-soo (Hwang Jung-min) as an elderly man, disrespected by the youngsters he encounters in his market stall; as he looks back upon his life we see an existence of suffering and despair unimaginable to the affluent youth of contemporary Korea. Of the four major episodes we see in Deok-soo's life, it is the first which may be the most traumatic and certainly the most formative for our protagonist. In Hungnam, 1950, Chinese invaders descend upon the North Korean city as part of the early stages of the Korean war - hundreds of families run through chaotic, screaming streets searching for an escape from impending death. The American military, stationed at Hungnam harbor, frantically welcome as many refugees on board their naval ship as possible before making a hasty escape. 14'000 escapees board successfully but, in an incredibly tense piece of film-making, we see the fates of those who failed to scale the SS Meredith Victory as ice-cold water subsumes the flailing bodies of unfortunate souls who fall into the sea. Deok-soo, despite straining with all his might, drops his younger sister to the water below; as his father goes to rescue her, offering himself to the uncertainty of unforgiving waves, the boat pulls away. "If I don't come back," Deok-soo's father shouts after him, "you're the head of the family. That means you put family first." From here, Ode to my Father shows us how, throughout his life, Deok-soo holds onto his father's words and follows them with all the strength in his heart. No task is too small nor any sacrifice too big for Deok-soo to make. His own hopes and dreams are of little importance to him yet, throughout the years, he yearns with an eternal hope that maybe one day he will be reunited with the father and sister he last saw on the cusp of death. 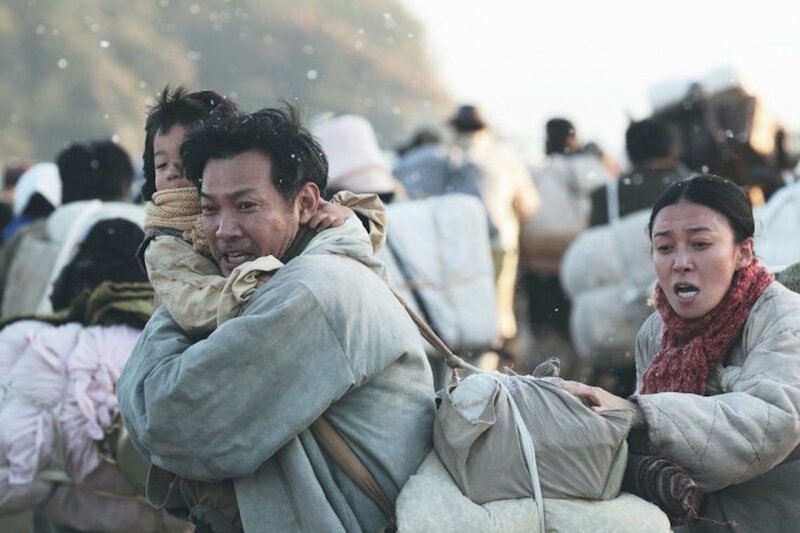 Ode to my Father follows in the footsteps of the modern Korean classics The Way Home and The Classic as Confucian fables aimed at a young generation who shamelessly may have forgotten the values the nation is built on. Whilst imported Western values of materialism and individualism shade how many see the modern Land of the Morning Calm, traditionally it has been Confucian ideals, those of filial piety, ancestral worship and the belief of the individual as simply one part of a much larger whole, that has shaped Korea. As we see Deok-soo sacrificing everything from his body to his dreams to help his family throughout decades of suffering, Yoon's film acts as something of a history lesson with a human face, and a lecture in moral and ethics simultaneously to a complacent generation ignorant to the hardships suffered by their ancestors. Yet, as Ode to my Father reminds us, it is not only the duty of Confucians to honour one's father but, also, to make sacrifices for the future. Indeed, Deok-soo sums this up perfectly in a conversation with his wife: "I'm thankful that all of these hardships have been suffered not by our children but you and me." As the film concludes, Yoon's camera pans away from a weeping Deok-soo and towards a magnificent sky-line of a modern Korea, punctuated by sky-scraping towers and sparkles of electricity. Deok-soo's hardships, his suffering and his labour, built this great nation Yoon shows us. This shot is one of the bleakest imaginable; imagine the conclusion of It's A Wonderful Life but without the happiness, the euphoria, which usually comes from personal salvation. Deok-soo has spent a lifetime in emotional and physical agony, an existence filled with torture, and such experiences can't simply be undone. More than once in the film, spiritually drained, Deok-soo wails: "Life is hard". Deok-soo's pain ensured, however, that the generations who follow him will never have to experience the sorrow he did - yet, it is up to the young of today, Yoon suggests, to show the appropriate respect to their forefathers and fulfill their end of the Confucian agreement. Yoon's film, as emotional as one can imagine, creates something of a new genre - the Confucian melodrama blockbuster; a truly spectacular (in all senses of the word) film.